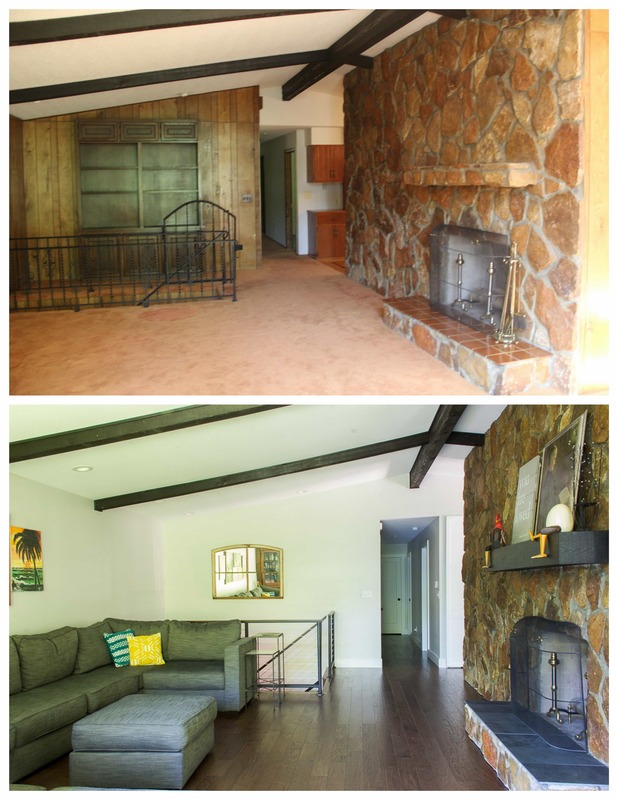 Renovated Modern Home Before and After Pictures! 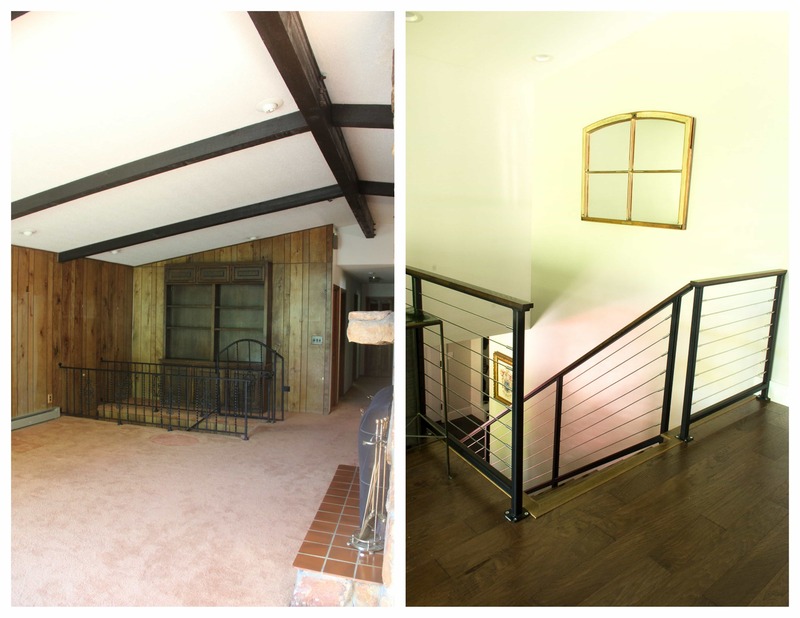 This renovated modern home will have you shocked that it’s the same house in the “before” and “after” pictures! In the past few weeks I’ve shared the kitchen and the bathrooms from my good friend’s renovated modern home. Today I’m going to share the rest of the home with you! 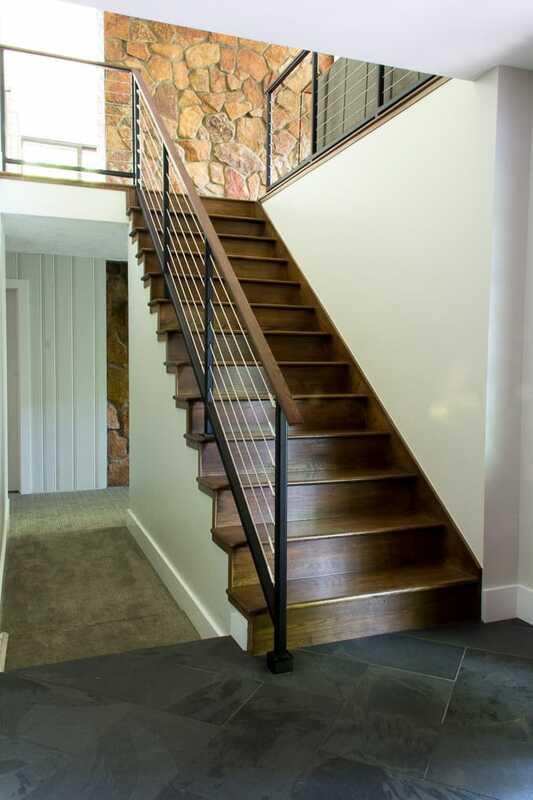 I’ll start with their amazing new staircase. 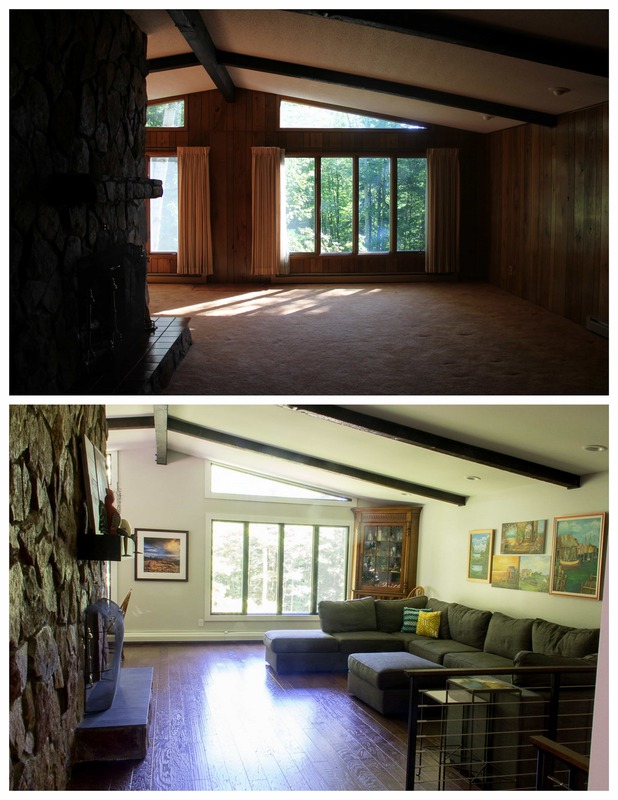 They tore out the wall and ceiling and made this a bright open space. This was the brainchild of the amazing Studio RAD Designs who was their architect for this whole project. 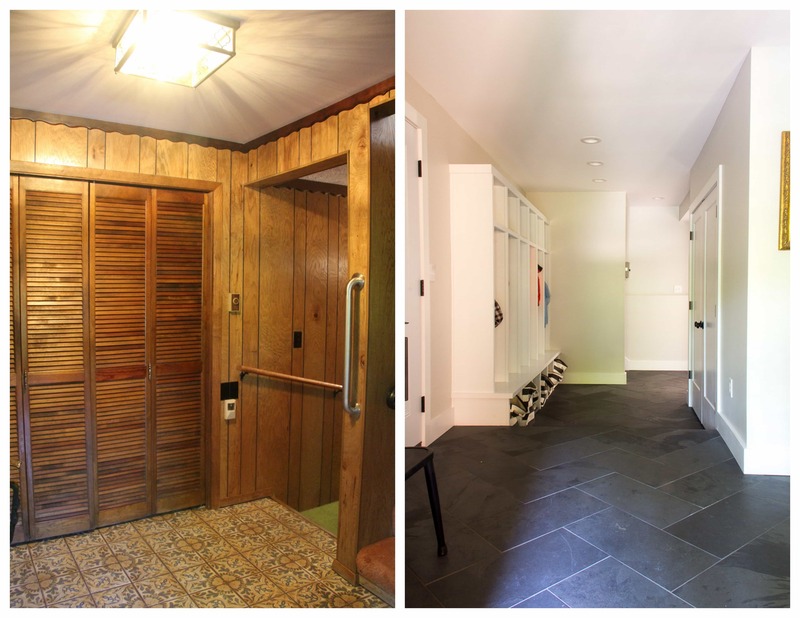 They also tore out the entry closet and created a large mudroom, going back into a space that used to be part of the garage. Now at the top of the stairs, rather than that awkward space where the bookshelf used to live, instead they have this tall wall that unifies the upper and lower level. They went with the color Benjamin Moore Grey Owl on all the walls, which is a great neutral. They kept the original windows, but painted them all black. Their new sofa is a LoveSac “Sactional” which is awesome for this large room. In the master bedroom the chandelier, wallpaper, and valances all came down in favor of everything being lighter and brighter. 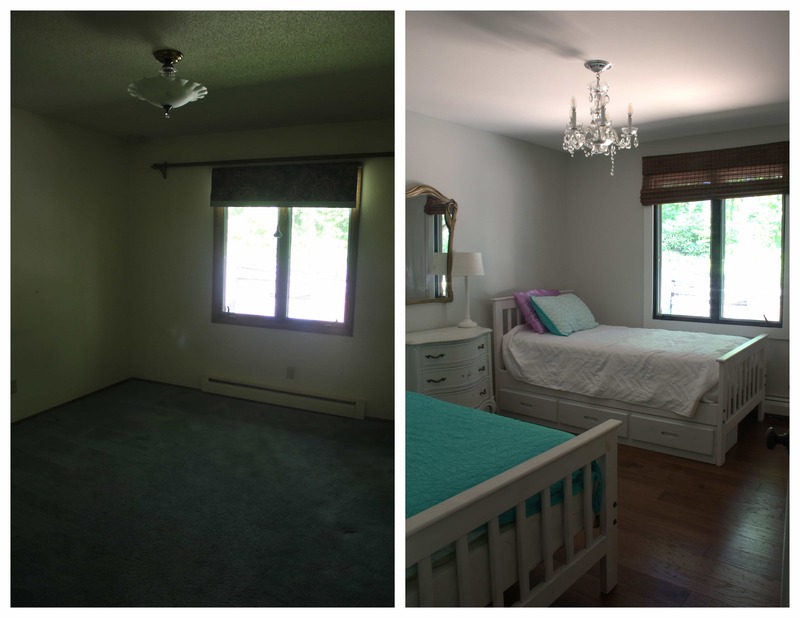 The kids rooms got new paint, lighting, and flooring as well. 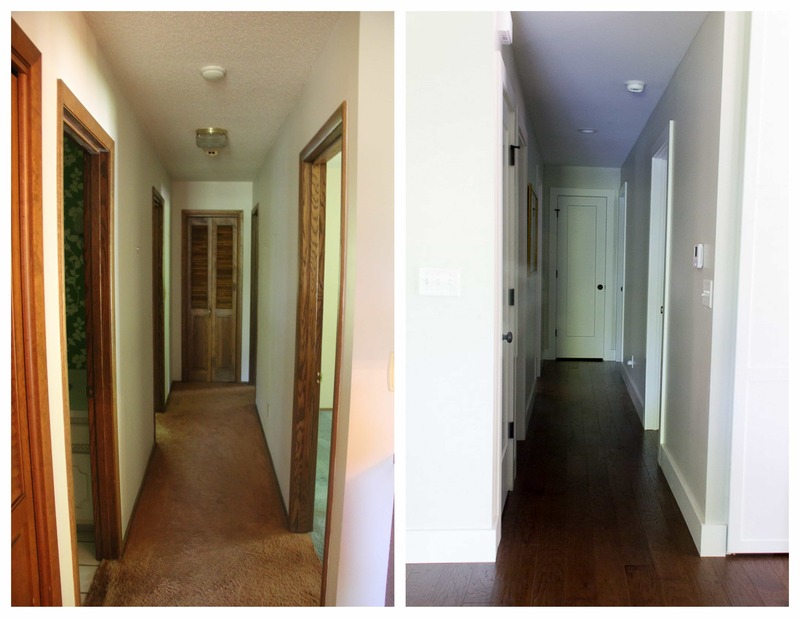 Here’s a look at the hallway before, and after. Even the hallway went through a dramatic transformation! Moving downstairs they decided to keep the original conversation pit, but give it a modern look. The playroom no longer has hopscotch carpet, and got a fresh coat of paint on every surface. 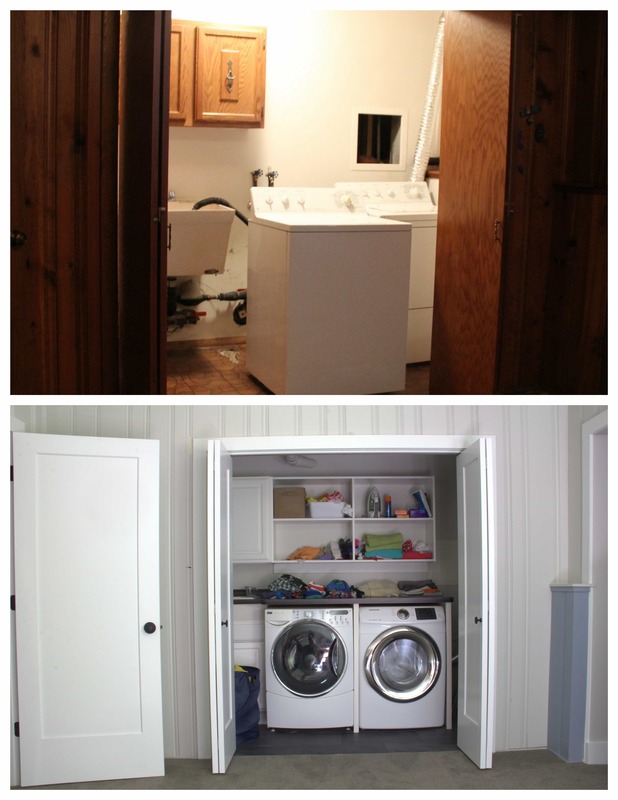 The playroom is also where their new laundry space is located. Finally in this basement bedroom they added an egress window. 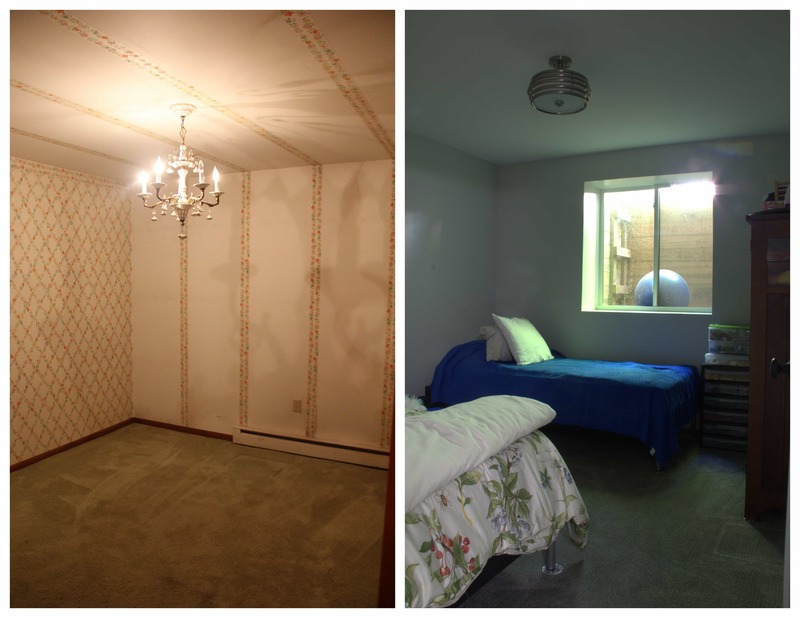 They also chose to tear out the wall AND ceiling wallpaper! 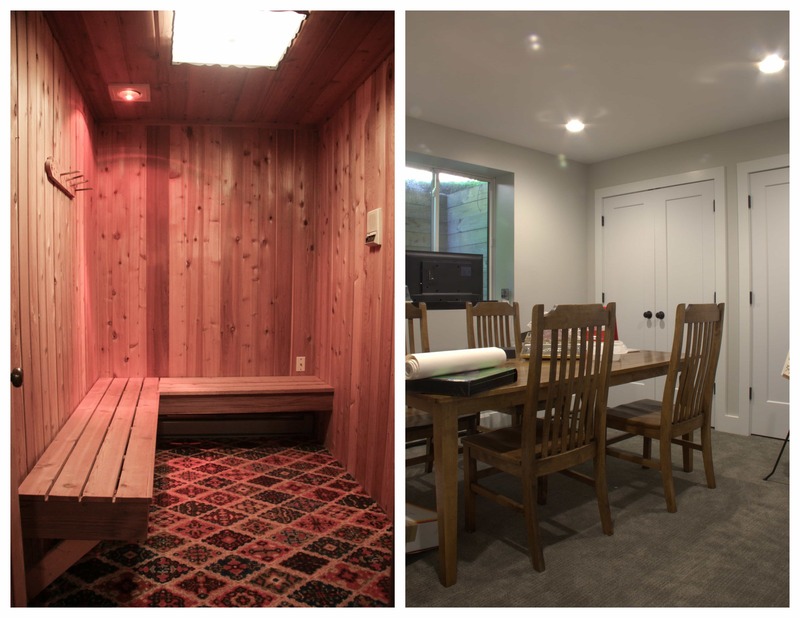 They also tore out the old Sauna and changing room, adding an egress window and creating a school room. Lastly they redid the study, which is the only space in the house left to unpack so I didn’t share pictures! 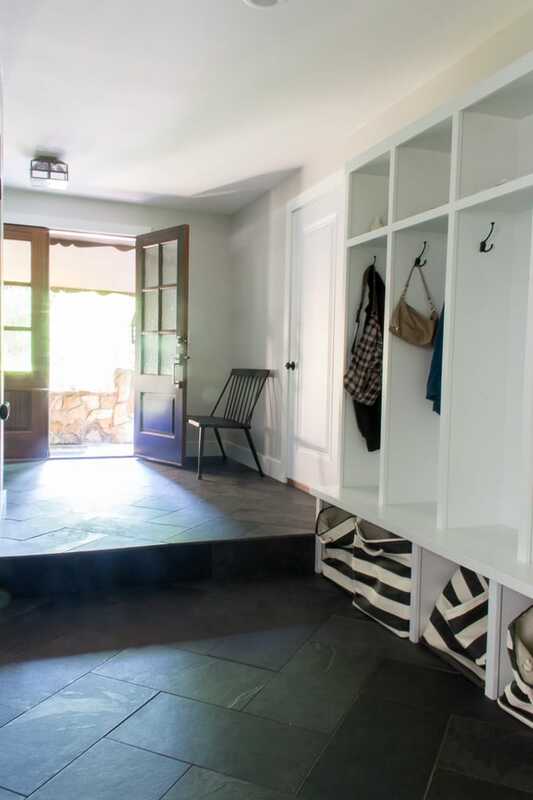 Let’s finish up by taking one more look at this amazing new mudroom. 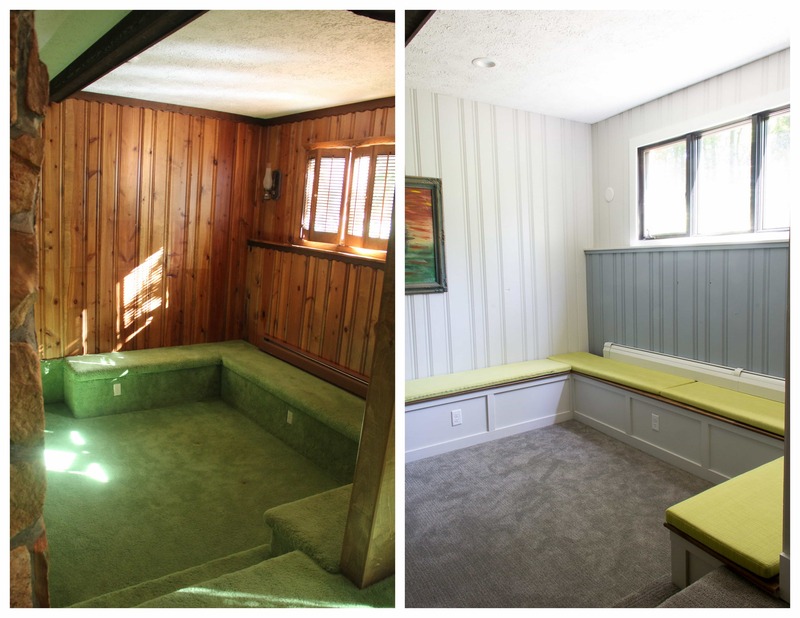 For a family of seven living in a place with LONG winters, this new mudroom is going to get tons of use. 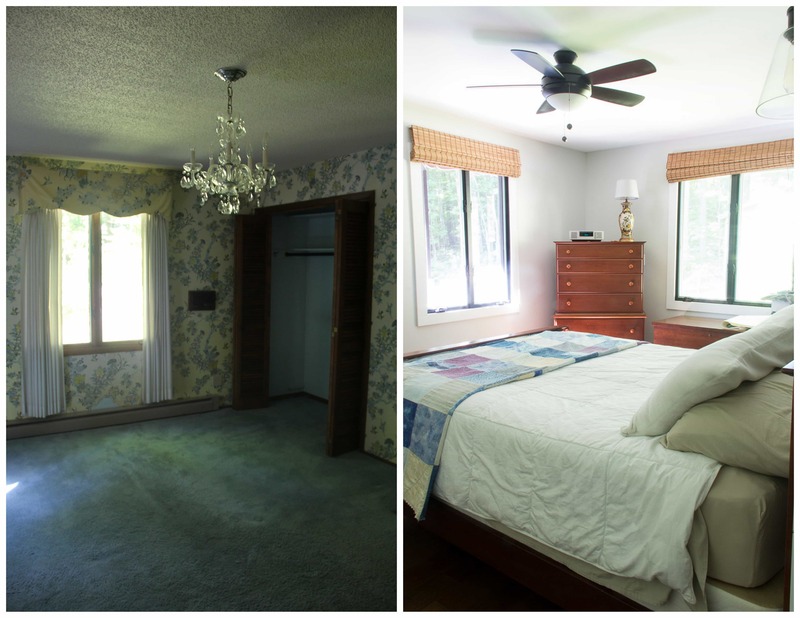 I hope you enjoyed seeing the “before” and “after” shots from their home! Don’t forget to head over to the kitchen post and bathroom post to see those transformations too! 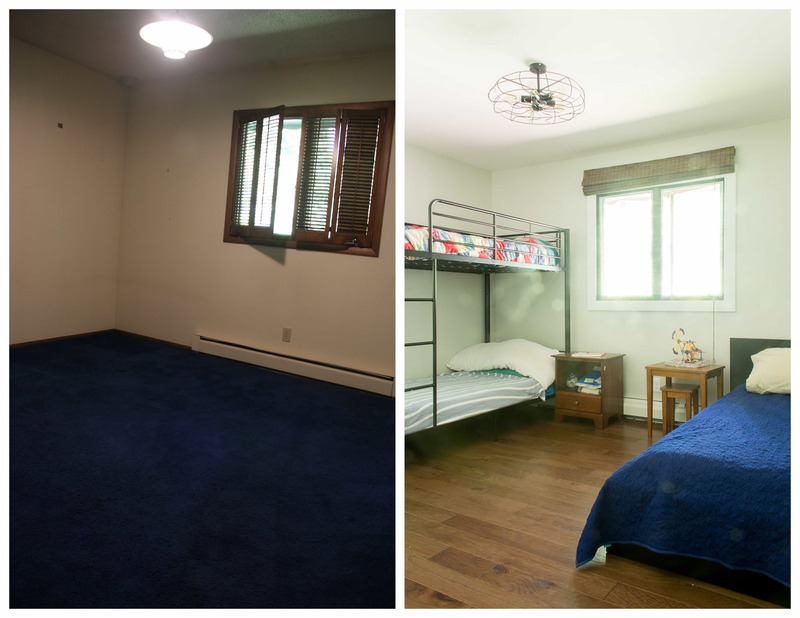 If you’ve ever thought an old house was beyond help, I hope this post inspired you! Thanks for stopping by today! Wow! 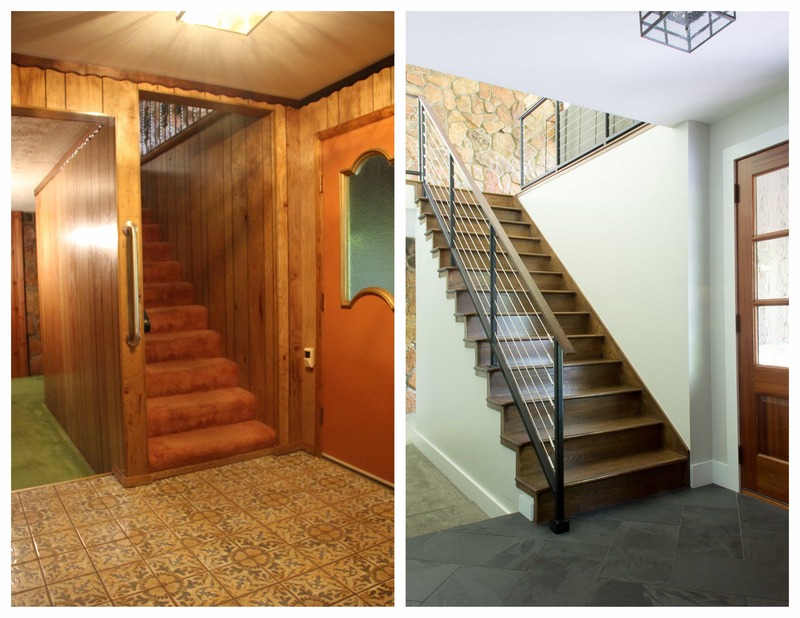 This reno is just beyond amazing. They really brought this house 100 years into the future. love it! 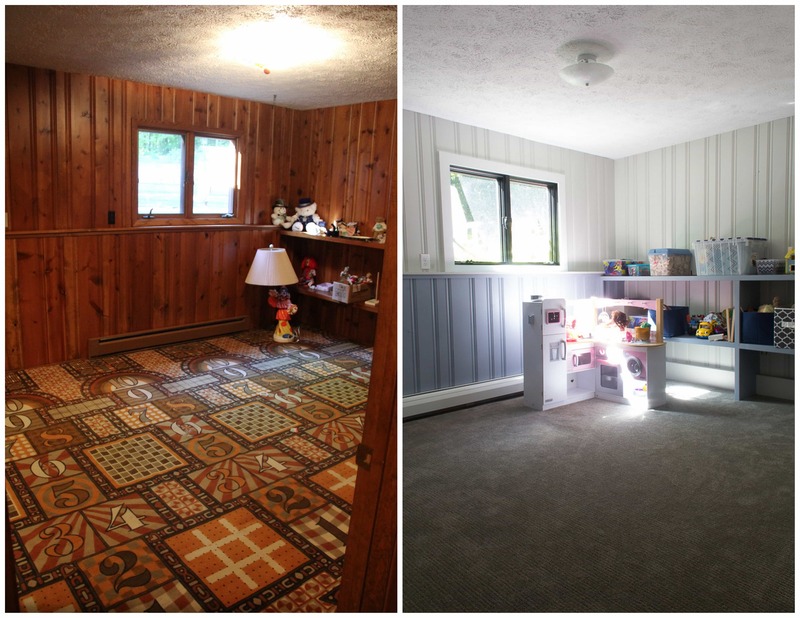 You’ve inspired me to work on our playroom/basement that is covered in wood paneling. what colors did you use? Thank you so much! I’m so glad this post could be an inspiration! The paneling is Sherwin Williams New Hope Gray. The rest of the walls are Benjamin Moore Gray Owl.